Last month, the Americas Cup Event Authority announced that Bermuda would be home to the 2017 America's Cup sailing competition. The event has a long and respected history, dating back to the mid-19th century. Here is a preview of what we'll be seeing in Bermuda in 2017. Take a look at the official announcement video to see what the race village could look like. "In 1851 a radical looking schooner ghosted out of the afternoon mist and swiftly sailed past the Royal Yacht stationed in the Solent, between the Isle of Wight and the south coast of England, on an afternoon when Queen Victoria was watching a sailing race. As the schooner, named America, passed the Royal Yacht in first position, and saluted by dipping its ensign three times, Queen Victoria asked one of her attendants to tell her who was in second place. "Your Majesty, there is no second," came the reply. That phrase, just four words, is still the best description of the America's Cup, and how it represents the singular pursuit of excellence." In more than 150 years of competition, only 4 nations have ever taken first in one of the hardest sports competitions to win. 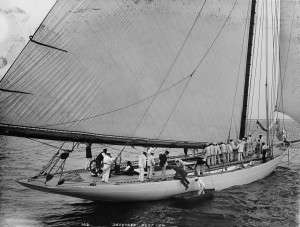 The first 100 years of competition were won by New York, the original winner of the race and the origin of the competition's name. All of us here in Bermuda are truly looking forward to this international event and can't wait until 2017.